Worship is about our lifestyle more than it is about music. That said, we recognise that music is very important. God often uses music in a very special way, so we take very seriously what it means for someone to lead worship when we meet together. Here we have opportunity to express our worship and thanks to God. Our prayerful hope is that people will have an encounter with God through His Holy Spirit. Worship should be heartfelt and we should be open to God’s Holy Spirit to inspire it. Worship is a communal experience, not just for individuals or those leading. We should seek God’s will and purpose through worship. This should then impact on our daily lives and on our living out the Christian faith. The music group play each Sunday morning. The team usually practice Thursday evenings and then rehearse and pray together before the service. Our evening services have a more traditional style, usually with the accompaniment of a piano. Can I join the worship group? Being a good musician is great, but we are eager to encourage those who have a gift in being sensitive to what God is doing through music in worship. This is very much a ‘heart thing’. 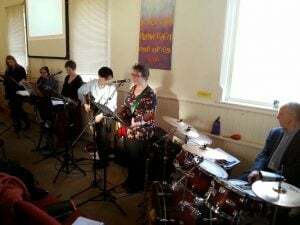 If you feel you have a talent as a musician either playing an instrument or singing as part of the team, then why not speak to Paul or Maria about joining the worship group.